The story of Long Island began with ice. As glaciers retreated at the end of the last Ice Age, they dropped and piled up hills of sediment. When the ice melted and seas rose, those piles of glacial debris were surrounded by the sea. Stretching out into the Atlantic like a giant fish, the island continues to change. Thousands of years later, water still re-sculpts the island’s shoreline. 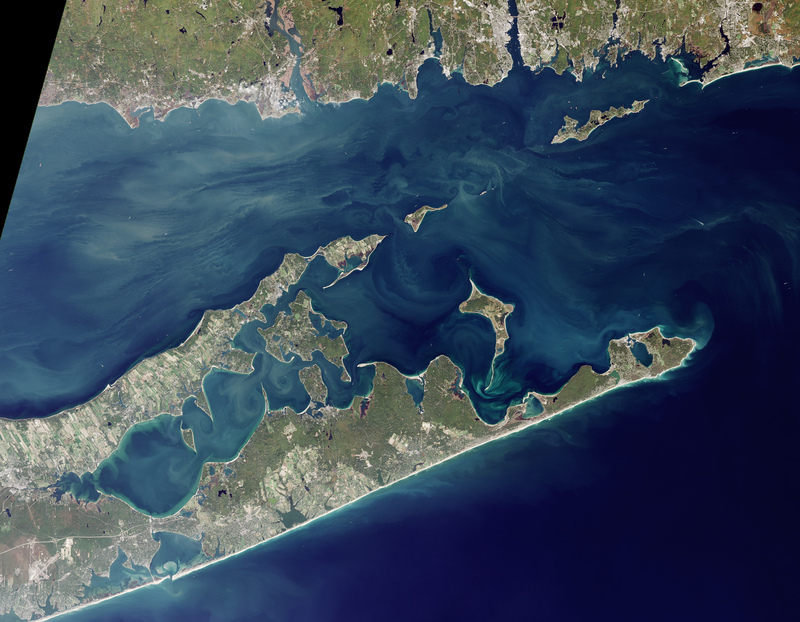 On October 17, 2016, the Operational Land Imager (OLI) on Landsat 8 captured this image of Long Island’s East End. While the North Shore is characterized by craggy inlets and peninsulas, the South Shore is lined with smooth, protective sand bars—the result of constantly pounding waves. 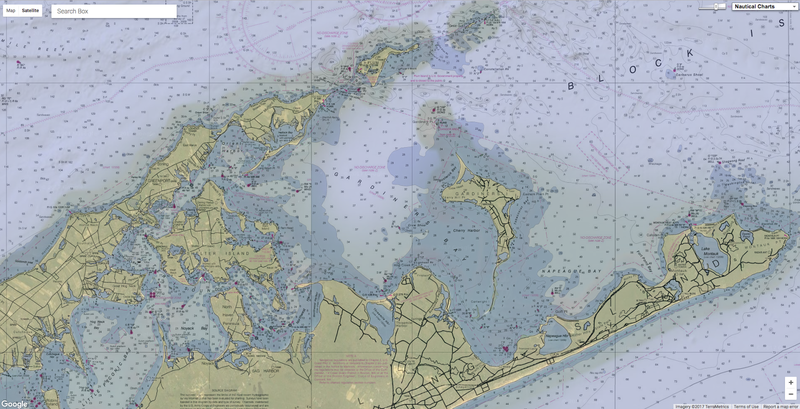 Between the branching tails of the East End lies Gardiners Island, which spans more than 3,300 acres and is closed to the public—a source of curiosity given its proximity to population-dense Long Island. In the 1600s, Gardiners was believed to have a cache of pirate gold. Modern scientists appreciate it for another form of booty: its rich coastal geology. 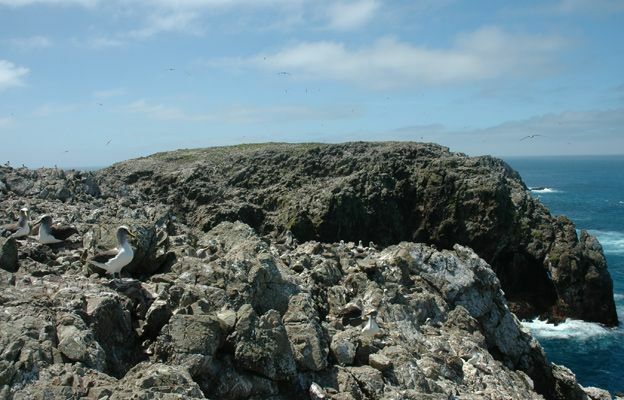 On the northern end of Gardiners Island (above), a fang-like feature juts into the water. This cuspate foreland at Bostwick Point owes its shape to the waves. As they hit the shore, waves agitate sediment along the coast. Combined, these processes can rake sand and sediment into this triangular feature. 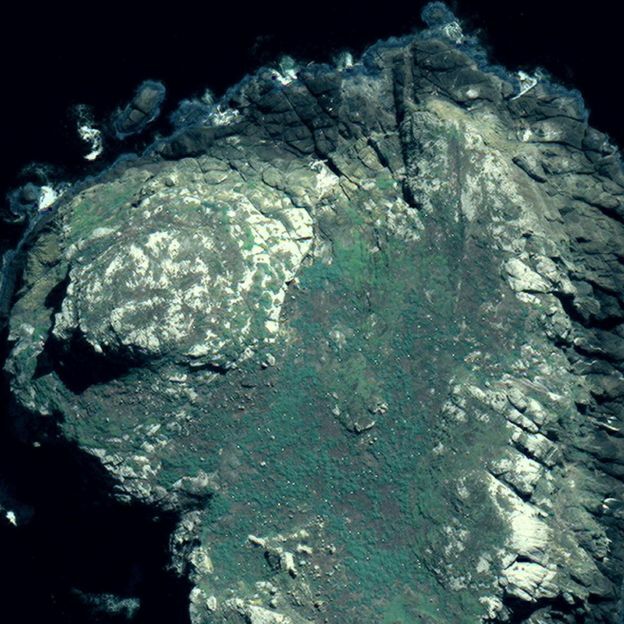 The opposite end of the island (below) includes a long, finger-shaped sand bank called a spit. These sand features frequently form at the mouths of inlets and in places where water must move around coastal barriers and other features. 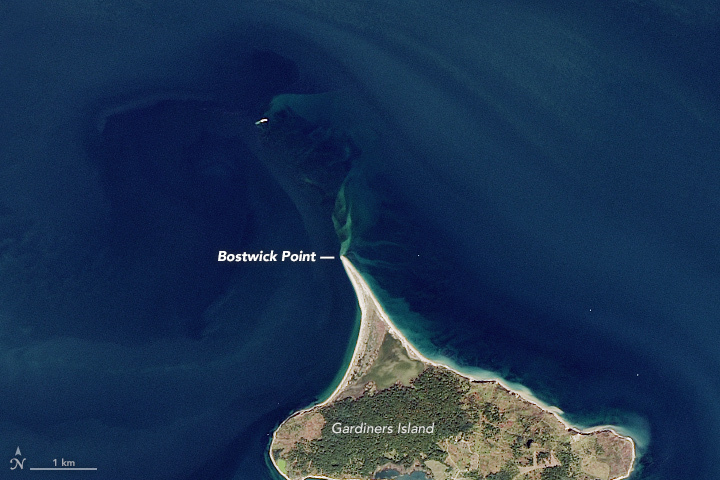 The spit projecting from the island’s southern end has grown by nearly a mile (1.6 kilometers) over the past few decades. 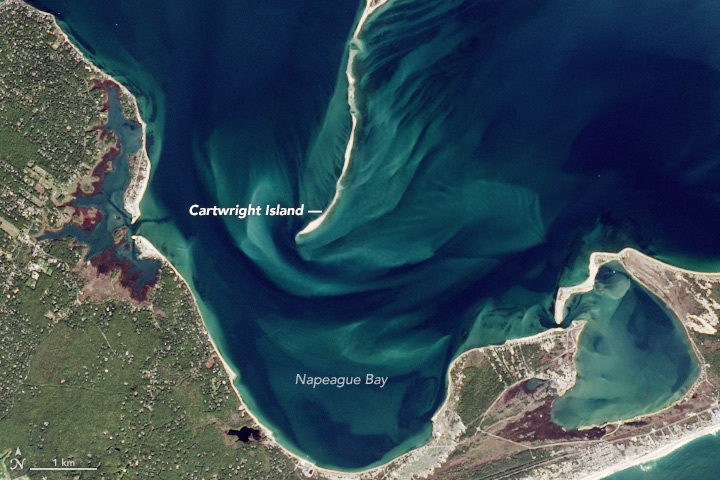 In the process, the ocean has breached its length at several points, creating smaller islets like Cartwright Island. 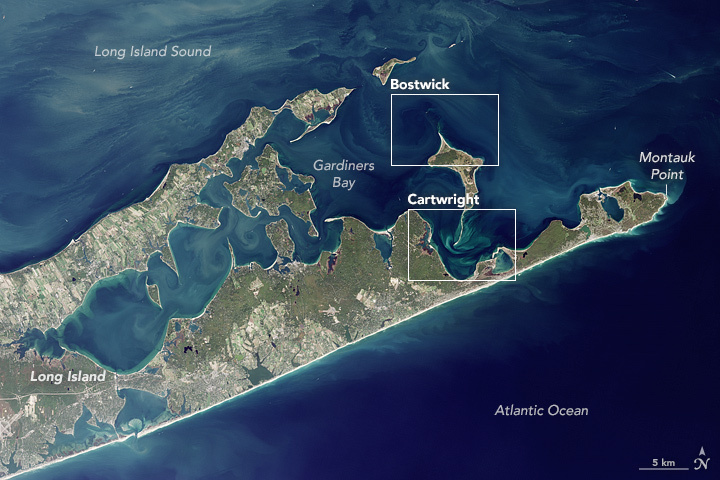 Coastline breaches most often form during hurricanes, nor’easters, and other potent storms, said Andrew Ashton, a coastal geologist at the Woods Hole Oceanographic Institution. 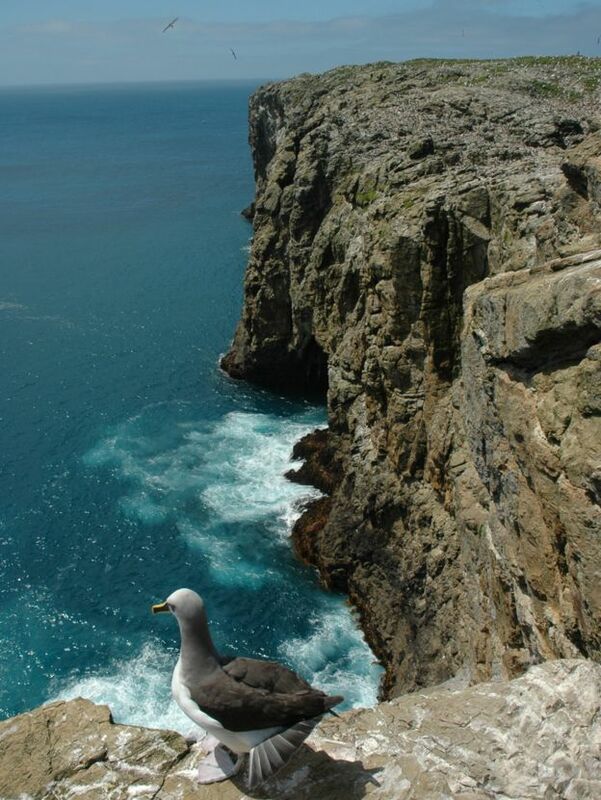 However, over time, the constant pounding of waves tends to smooth out spits, refilling the gaps between them. Strong currents tend to develop around such features. In this image, the faint, light-colored streams of sediment in the water trace this movement. The spit acts like a funnel, forcing water to move through a narrower channel and resulting in more powerful currents. To get the same amount of water through the space, its flow must speed up, Ashton said. 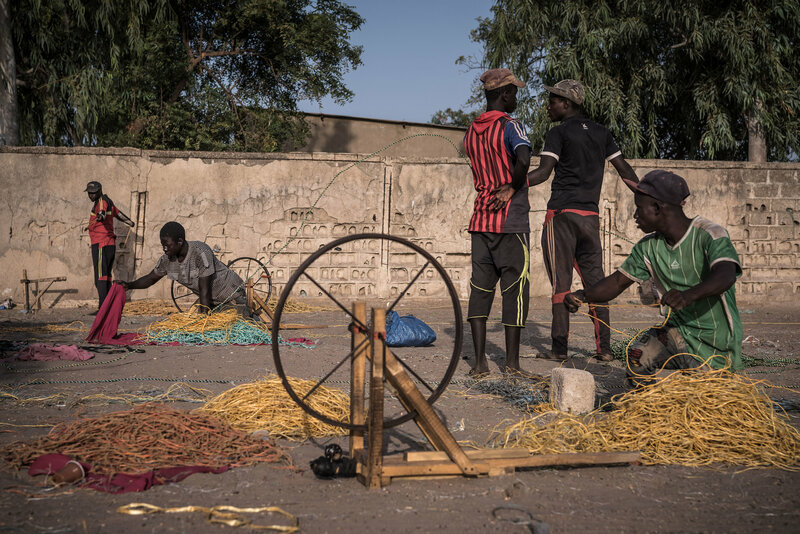 Vendors and wives of fishermen waiting for boats to return to Joal, Senegal. A world away in eastern China, Zhu Delong, 75, also shook his head as his net dredged up a disappointing array of pinkie-size shrimp and fledgling yellow croakers. Overfishing is depleting oceans across the globe, with 90 percent of the world’s fisheries fully exploited or facing collapse, according to the United Nations Food and Agriculture Organization. Senegalese fishermen with their meager catch. Increasingly, China’s growing armada of distant-water fishing vessels is heading to the waters of West Africa, drawn by corruption and weak enforcement by local governments. West Africa, experts say, now provides the vast majority of the fish caught by China’s distant-water fleet. And by some estimates, as many as two-thirds of those boats engage in fishing that contravenes international or national laws. 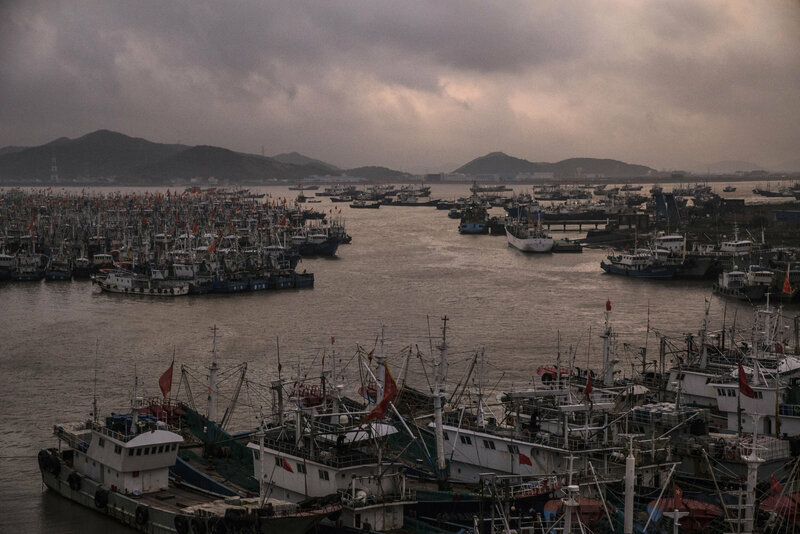 China’s distant-water fishing fleet has grown to nearly 2,600 vessels (the United States has fewer than one-tenth as many), with 400 boats coming into service between 2014 and 2016 alone. Most of the Chinese ships are so large that they scoop up as many fish in one week as Senegalese boats catch in a year, costing West African economies $2 billion a year, according to a new study published by the journal Frontiers in Marine Science. Over all, government subsidies to the fishing industry reached nearly $22 billion between 2011 and 2015, nearly triple the amount spent during the previous four years, according to Zhang Hongzhou, a research fellow at Nanyang Technological University in Singapore. Mor Mbengul was taught how to fish by his grandfather. But unlike his forefathers, he can no longer live from his catch. 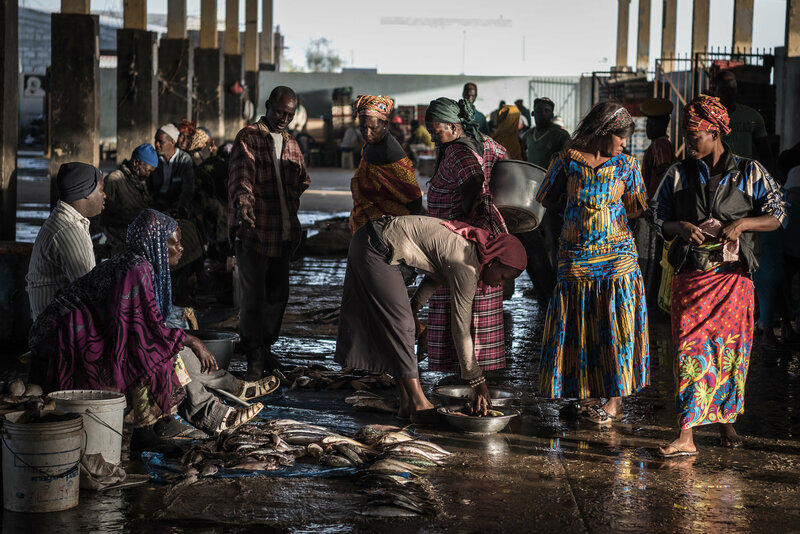 International trawlers have all but depleted Senegal's fish reserves. Many foreign fishing fleets refuse to stick to quotas. Buyers and sellers at Zhoushan fish market. China has depleted the seas close to home. “The truth is, traditional fishing grounds in Chinese waters exist in name only,” said Mr. Zhang of Nanyang University. A Filipino fishing boat that had been chased away from Scarborough Shoal in the South China Sea by a Chinese Coast Guard vessel last year. This maritime militia receives subsidized fuel, ice and navigational devices. 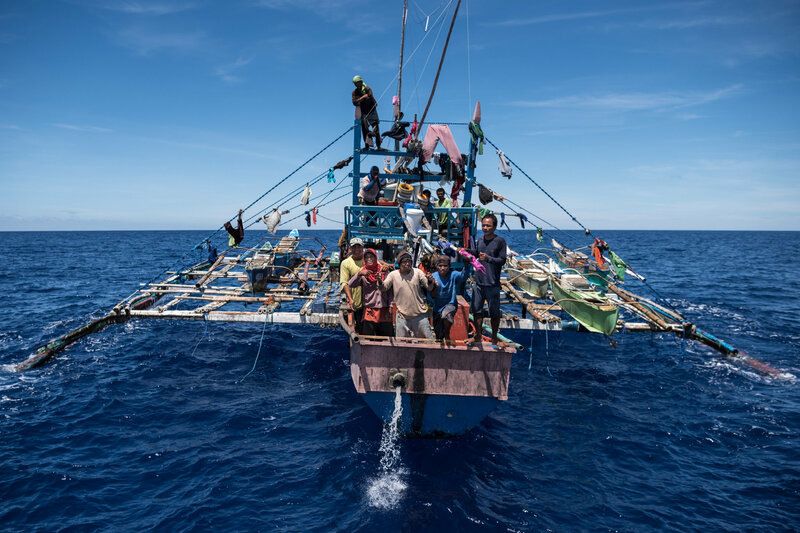 Backed by the firepower of Chinese naval frigates, they have driven away thousands of Filipino fishermen who depended on the rich waters around the Spratly Islands. Across the Philippine province of Palawan, the impact is reflected in the rows of idled outriggers and the clouds of smoke drifting across freshly denuded hillsides. Unable to live off the sea, desperate fishermen have been burning protected coastal jungle to make way for rice fields. But heavy rain often washes away the topsoil, environmentalists say, rendering the steep land useless. “Young boys spend their lives preparing to become fishermen,” said Eddie Agamos Brock, who runs Tao, an ecotourism initiative. 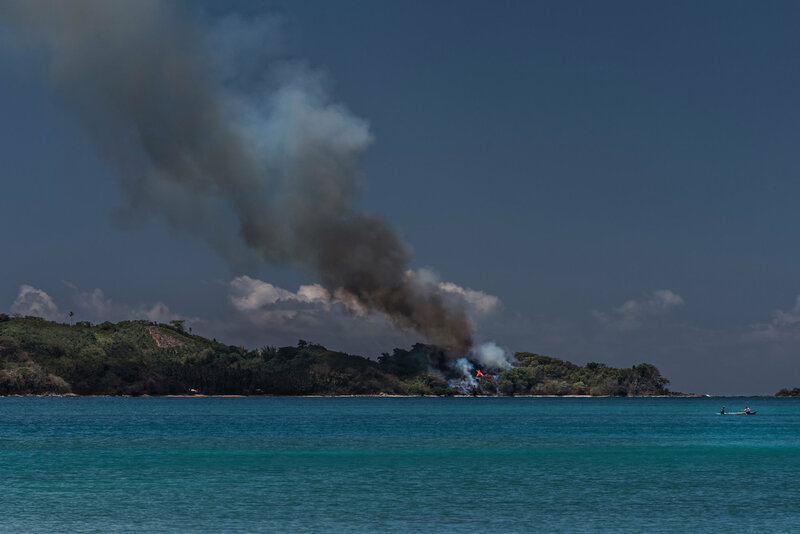 Fishermen in an outrigger in front of a fire for slash-and-burn agriculture on Darocotan Island in the Philippines. 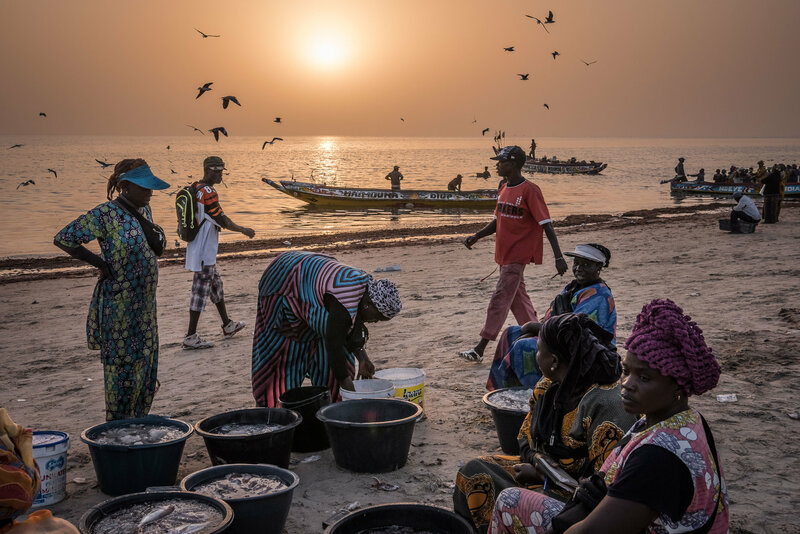 For Senegal, which stretches along the Atlantic for more than 300 miles, the ocean is the economic lifeblood and a part of the national identity. Seafood is the main export, and fishing-related industries employ nearly 20 percent of the work force, according to the World Bank. With two-thirds of the population under 18, the strain has helped fuel the surge of young Senegalese trying to reach Europe. 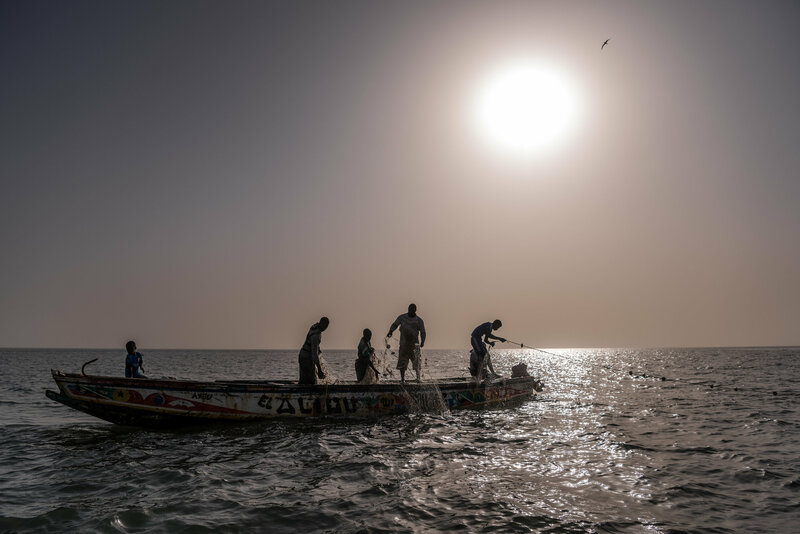 Fishermen pulling in nets off the coast of Joal, Senegal. Mr. Sall became a local hero after he single-handedly detained the captains of two Chinese boats that were fishing illegally. These days, residents curse him under their breath because he has expanded his campaign against overfishing to include Senegalese boats that flout fishing rules designed to help stocks rebound. “I understand why they hate me,” he said. Still, most of his ire is directed at the capacious foreign-owned trawlers. 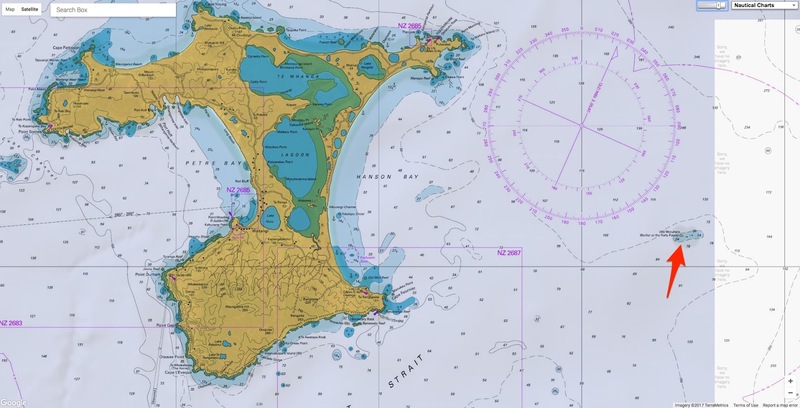 These days, more than 100 large boats work Senegalese waters, a mix of European, Asian and locally flagged vessels, according to government figures. That number doesn’t include boats that fly Senegalese flags but are owned by Chinese companies. The problem is magnified across West Africa. 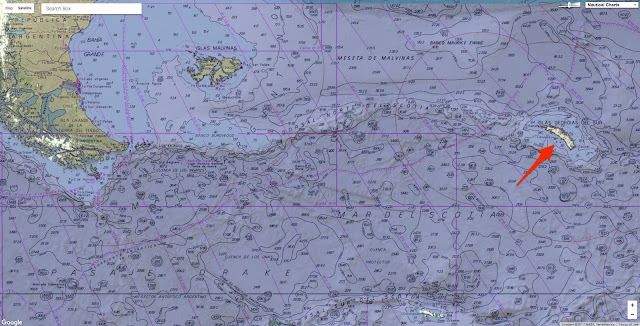 Some countries, like Guinea-Bissau and Sierra Leone, have just a handful of boats to police their national waters. 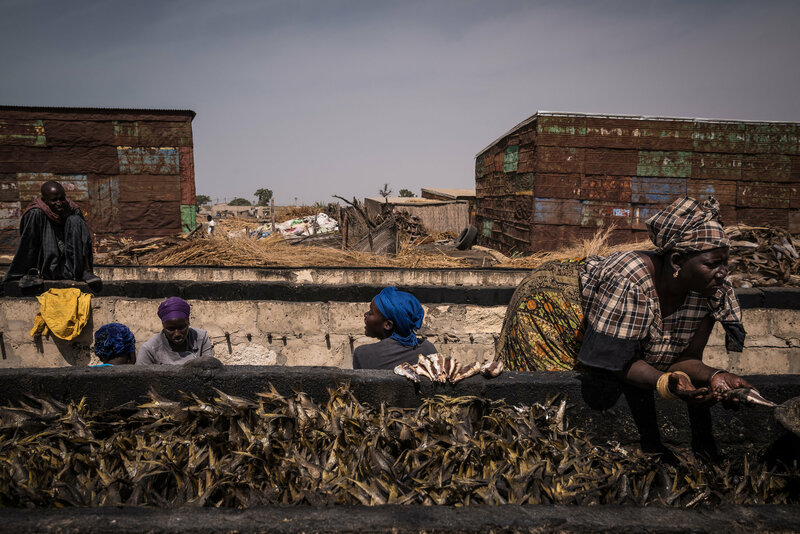 In Senegal, recent legislation has drastically increased fines for illegal fishing to $1 million, and officials pointed to the two impounded foreign-owned boats in Dakar, the nation’s capital, as proof that their efforts are bearing fruit. 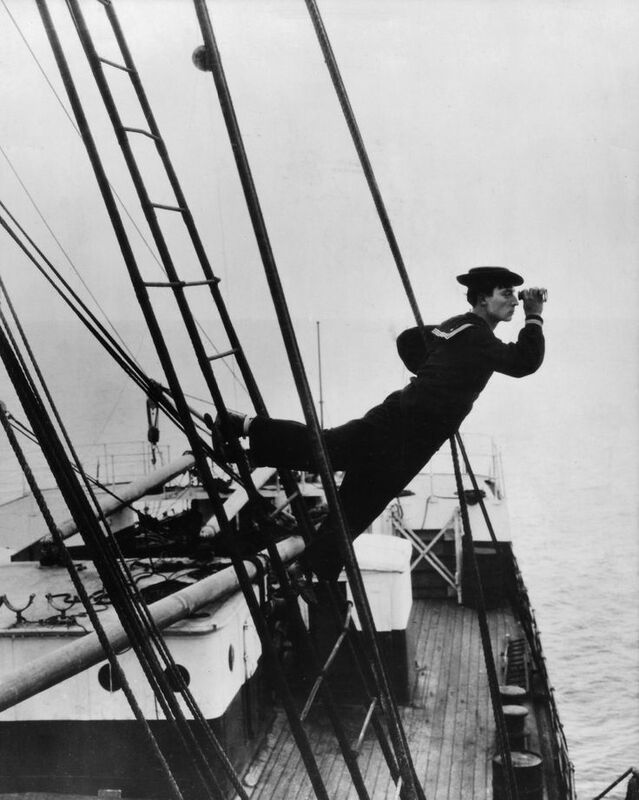 Glancing out at the sea, Capt. Mamadou Ndiaye described the challenges he faces as the director of enforcement for Senegal’s Ministry of Fisheries and Maritime Economy. Many scofflaws, he noted, fish on the edge of Senegal’s territorial waters and can easily escape when threatened. His agency cannot afford speedboats or satellite imagery; it could also use a functioning airplane. “Still, we have more than many other countries, and we have to help them, too,” he said. Most of the small pelagic fish that swim in Senegalese waters — and make up 85 percent of the nation’s protein consumption — migrate in enormous schools between Morocco and Sierra Leone. 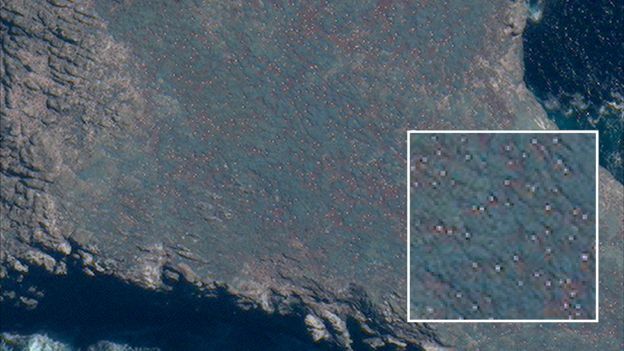 Along the way, they are scooped up by hundreds of industrial trawlers, at least half of them Chinese-owned, experts say. 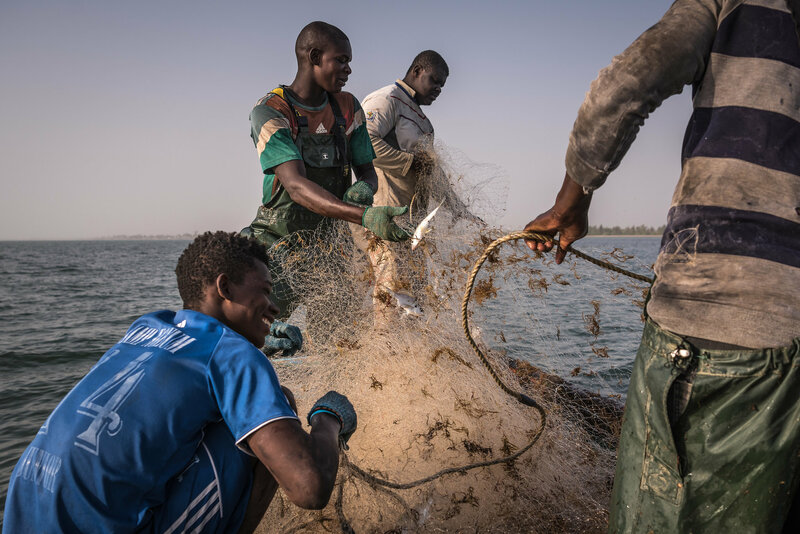 In 2012, Senegal stopped granting licenses to foreign trawlers for these small fish, but neighboring countries have refused to follow suit. Mauritania, where most of the fleet is Chinese-Mauritanian joint ventures, is home to 20 fishmeal factories that grind sea life into exported animal feed, with another 20 planned, according to Greenpeace. Protecting the seas sometimes means saying no to China, whose largess is funding infrastructure across Africa. “It’s hard to say no to China when they are building your roads,” said Dr. Samba, the former head of Senegal’s oceanic research institute. 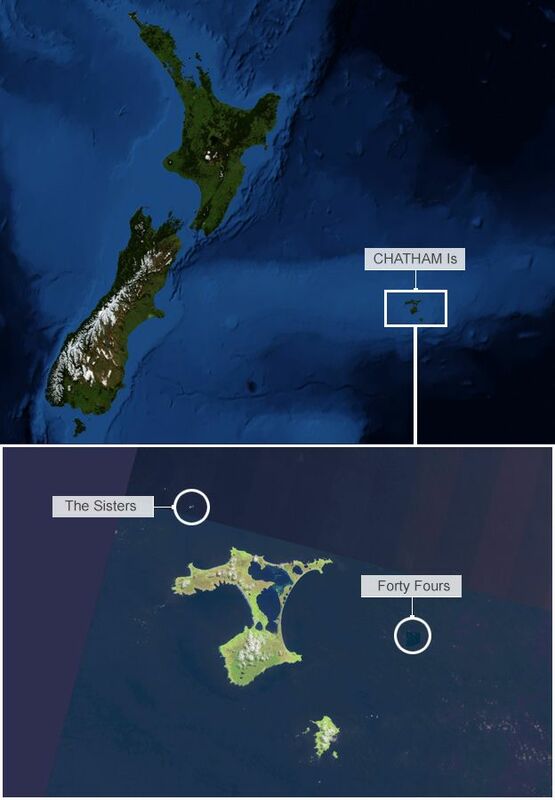 Then there is the lack of transparency that keeps national fishing agreements with China secret. “There is corruption in opacity,” said Rashid Sumaila, director of the Fisheries Economics Research Unit at the University of British Columbia Fisheries Center. 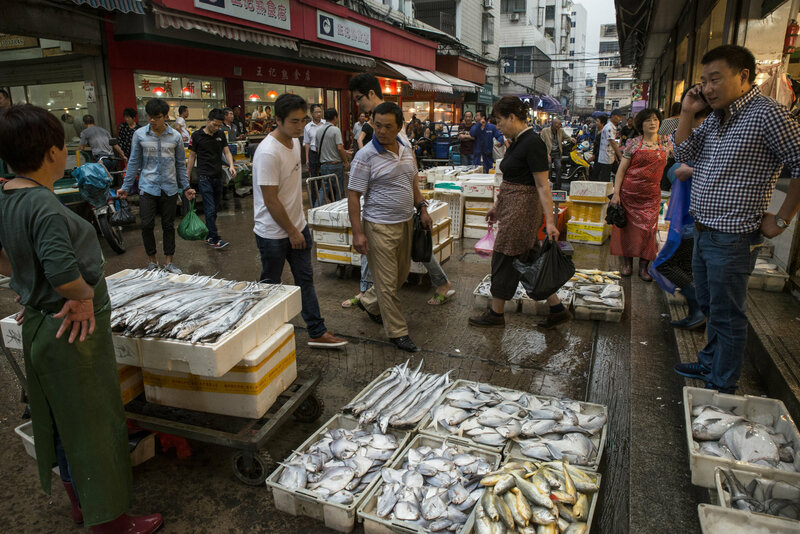 Beijing has become sensitive to accusations that its huge fishing fleet is helping push fish stocks to the brink of collapse. Women selling fish at the street market in Joal. Here in Joal, the dwindling catches have prompted the closing of three of the town’s ice factories, with the fourth barely holding on. On the town’s main quay, where women wade into the surf to meet arriving pirogues, the competition for fish has become intense. “We used to have big grouper and tuna, but now we are fighting over a few sardinella,” said one buyer, Sénte Camara, 68. On a good day, she makes $20; on a bad day, she loses money. “The future is dark,” she said. To catch anything, fishermen have to venture out farther, putting their lives at risk if an engine stalls or a late summer storm barrels through. Sometimes the danger is a super trawler whose wake can easily swamp a pirogue. Five hundred women in Joal work full time salting, grilling and drying mackerel, anchovy and sardinella. “They leave us with nothing, and we are powerless to stop them,” Ms. Mbaye said. This fascinating talk poses the question: is the way science approaches life’s biggest mysteries restricting our ability to solve them? Life on this planet is the history of rule breakers – species that didn't get the memo about how they were supposed to behave. So if we are studying rule breakers, then shouldn't how we study them break the rules, too? Alejandro Sánchez Alvarado is a researcher at the Stowers Institute for Medical Research and the Howard Hughes Medical Institute and Fellow of the American Academy of Arts and Sciences. Dr. Sánchez Alvarado's current research efforts are aimed at understanding the molecular and cellular basis of animal regeneration. Alejandro Sánchez Alvarado is an advocate for underwater creatures with behaviors almost too weird to believe. From a plankton/jellyfish that reproduces asexually and births its slinky-like progeny from its “head” (see below) to a worm that can be sliced into 18 pieces and keep living, the researcher believes investigating these little-understood lifeforms — and finding new ones — may hold the secret to new breakthroughs in science. This 95% could be the key to cures for currently incurable diseases, better understanding of our genetic history, expansions to our tree of life, if only people believed in the value of this exploration, Alvarado says. “We are measuring an astonishingly narrow sliver of life and hoping that those numbers will save all our lives [by propelling research],” he says. 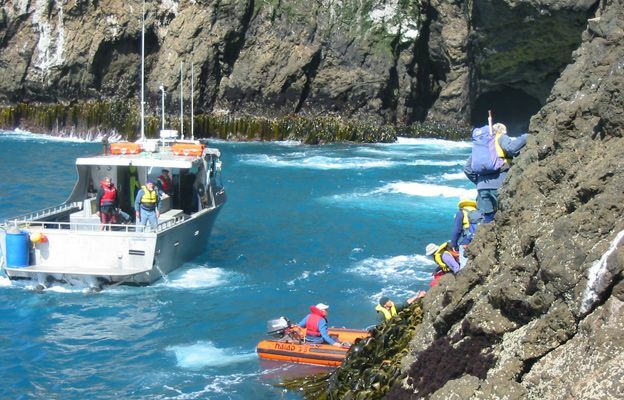 “What is even more tragic is that [many underwater creatures'] biology remains sorely understudied,” Alvarado says. For example — the Schmidtea mediterranea, a type of flatworm that is common in coastal areas around the Mediterranean can regenerate itself after being chopped up into parts, yet it isn’t a household name or hot button topic in science. “You can grab one of these animals and cut them into 18 different fragments and each and every one of those fragments will go on to regenerate a complete animal in under two weeks,” he says. “For the past decade and a half or so I’ve been trying to figure out how these little dudes do what they do and how they pull this magic trick off, but like all good magicians they’re not really releasing their secrets,” Alvarado says.